When a gold discovery makes the news, it’s usually because a very big piece of the precious metal has been found – or a lot of big chunks. You’ve seen those stories. They report that an underwater diver has pulled gold coins out of the sand at the bottom of the ocean, that a prospector just found a huge nugget in a stream or a hobbyist with a metal detector just discovered a buried can full of gold coins. There’s no doubt you can get rich pretty quickly if you find a big piece of gold. But looking for small pieces is even better, for reasons like these . . . The odds of finding small pieces of gold are much greater than the odds of finding big pieces. Because even small quantities of gold are worth a lot, focusing on small gold-bearing items that you can recycle and refine can make you more money than you expect. 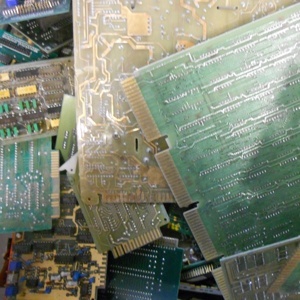 Shown: gold-plated circuit boards that our customers have shipped to us for recycling and refining at the best prices. The best thing about looking for small pieces of gold is that if you start looking, you are really going to find them. (That cannot be said if you go out and buy a metal detector, for example, or if you put on scuba gear and start poking around on the ocean floor.) Here are some of the places where you are going to find small pieces of gold. In scrapped computers. You’re going to find gold easily if you concentrate on printed circuit boards that come from large desktop computers. You can see the gold on the edges of these printed circuit boards, on the “fingers” that allow the boards to be plugged in to connectors. You’ll also find gold in the pins that allow central processing units (CPUs) to be plugged into motherboards. There isn’t a lot of gold in these items – only a few pennies worth in each component you recycle. But it is not difficult to get large quantities of them if you start a recycling company. Hospitals, colleges and many businesses are tossing old desktops these days and you can negotiate to get them for little or no money. And you can do the same by recycling computers that you can collect from municipal dumps and recycling centers. 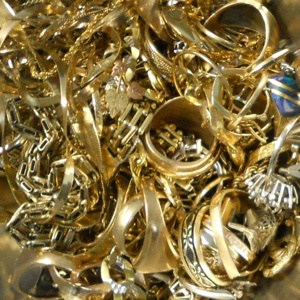 Shown: assorted karat gold and gold-filled jewelry, which GoldRefiners.com can recycle and refine for you. In easy-to-overlook small items of jewelry. If you walk into a jewelry store or antique mall, it’s easy to spot large new or antique items that contain a lot of gold. Instead of focusing on items like those, be on the lookout for little items like earring backs (the clips that are used on the back of stud earrings), tuxedo studs, and even tie tacks and their back-end clips. Forty or 50 years ago, these items were often gold-filled and if you can find a batch of them, you have something that you can recycle profitably. Also be on the lookout for old tuxedo-shirt studs, which can be made of gold-filled, an alloy of gold, or even karat gold. In decorative gold-filled bands and inlays on items that are not made of gold. If you keep your eyes open at antique stores and malls, you can sometimes find gold in gold-filled bands on old ceramic cigar and cigarette holders, on lighters and cigarette cases, and even on violin bows and other musical items. Our precious metals recycling experts are here to advise you on where you can find gold to recycle, and how to process it once you have. Why not give us a call at 800-426-2344 to talk things over.